We last stayed on Torsa 16 ago - we were tenants until 2002 for about 15 years or so - we know the location very well and were delighted to see all the improvements which have been made. We used to use our own boat and mooring arrangement so it was a little difficult to get used to another way. Jenn, however, was patient and friendly in showing us how everything worked. It was great to have the buggy to carry luggage and shopping up to the house but we think its brakes need some attention as the descent was a little scary! The house benefits greatly from a conservatory which takes in that fabulous view even when the weather is dodgy. Kitchen is great and has all mod cons except a dishwasher which as there were only 2 of us didn't matter but washing up for 6 could be tedious.The bedrooms are comfortable and well-fitted and it was great to have a bathroom upstairs as well as down. The island is beautiful and has great birdlife and wild flowers as well as a number of inquisitive cattle and sheep! Mike and Jenn were friendly and helpful - all in all, a great stay in a beuatiful place. This cottage is absolutely perfect. It was spotlessly clean and in great condition with plenty of space. We took three dogs and they loved the freedom to chase round the garden and explore the island on foot. They also loved the boat, after the first nervous sail! We thoroughly enjoyed exploring the coast. The scenery is amazing. We were so lucky with the weather that everywhere glistened, the water was so calm and still it reflected the mountains. It was so serene and beautiful. Mike and Jenn were very welcoming and helpful. I cannot say anything negative about this whole holiday, it was just the getaway we needed. Thank you so much. Torsa is the perfect private island for those who love the unspoilt beauty of Scotland’s islands. We spent hours exploring Torsa, which has a variety of terrains and feels much bigger than its 0.44 square miles. Wildflowers are in abundance, including beautiful marsh orchids, ragged robin and yellow flag iris. We saw over 20 species of birds, more than 10 of those within the walled garden. Swallows and house martins were nesting in the eaves, and provided flying displays whilst we had breakfast, overlooking Loch Melfort. Around low tide, it’s possible to walk round the island at sea level, if you don’t mind a bit of scrambling. The east side has particularly clear water and was perfect for snorkelling and kayaking. From high points on the island we watched glorious sunsets over Mull and then waited patiently by the rocky shoreline to see otters. We were not disappointed - on five evenings we saw a pair of otters playing in the sound and another that stayed by the rocky shore just metres away from us. The handsome Luing cattle are good weather indicators – if they’re paddling in Ardanamir Bay in the morning, it’s going to be warm. Torsa Farmhouse is very well equipped and furnished – squeaky clean with fluffy white towels and bright white bed linen. We arrived with very little food – the car was full with wetsuits and walking, snorkelling and kayaking gear. The lack of supplies wasn’t a problem. We had an excellent dinner of local langoustines at The Atlantic Centre at Cullipool (Saturdays only at present). The Oyster Brewery Bar in Ellenabeich was also well worth a visit – excellent beer and again, superb seafood. The shop on Luing (limited opening hours) sells essentials, local fresh food, beer, wine and wonderful bread, baked on the island. There is a bigger store at Balvicar on the Isle of Seil, also selling fresh bread and pastries baked in store. In all of these places, we were given a very warm welcome. A little plea - support local businesses! We were very lucky with the weather – five warm, balmy days when we were outside all the time. When Storm Hector arrived, we were cosy in front of the log burning stove. The RIB ‘Cutty’ behaved perfectly all week and enabled us to shadow the sea kayakers in our party as far as the Bridge over the Atlantic. The Gator buggy was extremely useful and gave no problems. It would be easy to stay on the island for your whole stay – the stunning surroundings and ever-changing light makes it a photographer’s paradise. We went a bit further afield and did circular walks on Luing and the Isle of Seil (www.walkhighlands.co.uk). We also did a 5 hour wildlife and whale search via the Gulf of Corryvreckan, with Sealife Adventures on Seil. Please see separate 5* review. Yes, we saw a whale breaching! Torsa is a truly beautiful, tranquil place but its rough terrain is boggy in places and has some steep drops. You will need wellies , sturdy footwear and (probably) full waterproofs. You might get splattered with cow poo if the person driving the Gator buggy doesn’t look where they’re going but so what? Lots of adventures to be had, not least reversing off the three-car Cuan ferry …..
Booking and communication with Mike was efficient and easy. Thanks to him and Jenn for their warm welcome at the Cuan ferry and all their helpful advice. We had a great time at Torsa with our own island and boat. Saw otters, buzzards, curlews, herons and so much more. Wonderful comfy bed and great wood burning stove for colder nights. Took all our food with us but the Atlantic centre which was about an hours walk across the bay was lovely with great food and wine/beer if wanted. Great trip to Ardmaddy by boat and walked round the lovely gardens as well as walking a few miles to the pub by the bridge across the Atlantic. So peaceful with amazing sunsets, can’t believe what a fantastic place this is and would love to go back! Jenn and Mike were so helpful and made it a pleasurable stay. What a truly unique and magical place to stay. 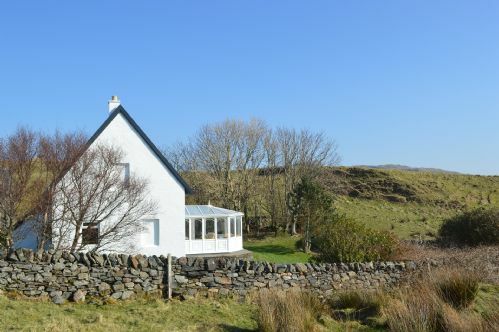 A chance to experience isolation, fantastic wildlife, spectacular views and amazing outdoor adventures whilst coming home to the comfort of the farmhouse. We didn't want the adventure to end! Mike and Jen were very welcoming and helpful hosts. fantastic time in a beautiful, remote location. Great for walking and outdoor adventure. The cottage was spotless, and equipped to the very highest standard. This was the most tranquil place to rest up and recharge the batteries. From the first contact we had with Mike to the moment we left, the service provided was absolutely spectacular. The house and island itself was better than we could have possibly imagined, plenty of information on the local area was given and we were not left wanting for a thing. Highly recommended this to anyone looking for a little escape and we look forward to visiting again. A great family holiday, the kids and dog loved exploring the island and we had a lot of fun out on Cutty, the boat. The house was clean and comfortable and it was good to be away from it all for a week, thanks to Mike & Jenn, we'll be back.